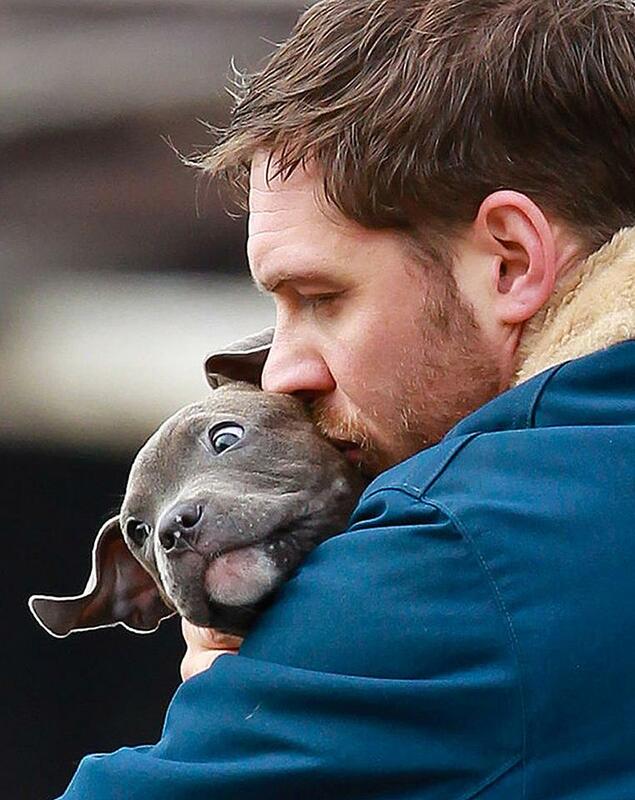 Is there anything cuter than Tom Hardy and a puppy? The answer is no…no, there is not. 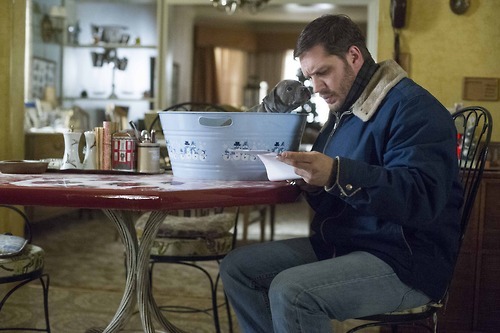 Belgian director Michaël Roskam‘s first English-language feature, The Drop, with Tom Hardy, Noomi Rapace and featuring the late James Gandolfini‘s final screen performance, “drops” in less than two weeks. The film, in which a man called Bob Saginowski (Hardy) finds himself at the center of a robbery gone awry and entwined in an investigation that digs deep into the neighborhood’s past where friends, families, and foes all work together to make a living – no matter the cost, and one I’ve been talking about for some time (if you’re not a fan of any of the above, sorry, but there’s more to come) was made from the first ever screenplay by writer Dennis Lehane, who adapted is own short story. He has subsequently turned the screenplay into a novel, out next Tuesday, September 2. The screenplay itself was based on an earlier Lehane short story called “Animal Rescue,” (the original title for the film- “what was wrong with that?”, I have to ask), which originally appeared in a short story collection called “Boston Noir”, about a killing that results from a lost pit bull. As the writer explains in the featurette below, that story was based on a book he started more than a decade ago, but shelved. After the movie was made, he was asked to do a “novelization” of the script, an idea he hated, but found that there were things from from the original novel that didn’t make it to the story or the script plus things original to the script that were cut either from that screenplay or from the finished film, that he still wanted to explore. Add all of that together and the result was a new book, now also called, “The Drop”. In the interest of full disclosure, I an ardent Lehane fan. He’s one of the few contemporary writers that I feel will always merit the purchase of an actual book, as opposed to the digital version. Lehane’s work, whatever form it takes, seems to lend itself particularly well to the screen. There have already been memorable adaptations of the novels Mystic River (dir. by Clint Eastwood), Shutter Island (Martin Scorsese) and Gone Baby Gone (which put Ben Affleck on the directorial map). Once Batfleck finally finishes work for Zack Snyder‘s Superman sequel, he’ll be back behind the camera for Live By Night, another Lehane adaptation. For his part, Lehane is also writing episodes of the final season of HBO’s “Boardwalk Empire” (JMHO, but that’s reason enough to keep watching) as well as developing “Ness”, a prospective television project about famed bootleg-buster Eliot Ness. The Drop, directed by Michaël Roskam, with Tom Hardy, Noomi Rapace, James Gandolfini, Elizabeth Rodriguez (“Orange is the New Black”), James Frecheville (Animal Kingdom) and Matthias Schoenaerts will screen at the 2014 Toronto International Film Festival on Septemer 5. It has also just been announced that the film will screen in competition at the 62nd San Sebastián Film Festival on September 26. It opens in the US on September 12 and in the UK on 14th November. Tom Hardy as Boband James Gandolfini as Cousin Marv in THE DROP. Copyright © 2014 Twentieth Century Fox. Director Michal R. Roskam, James Gandolfini and Matthias Schoenaerts on the set of THE DROP. Copyright © 2014 Twentieth Century Fox. Matthias Schoenaerts and Director Michal R. Roskam on the set of THE DROP. Copyright © 2014 Twentieth Century Fox. 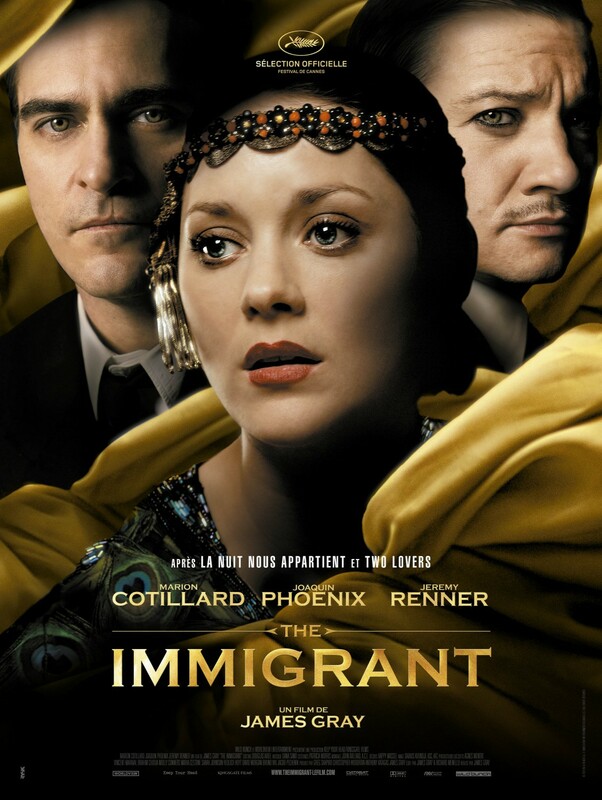 Cotillard, Phoenix and Renner in The Immigrant – Now Streaming! Turning on Netflix the other day, eager to hunker down and binge on the last six episodes, ever, of “The Killing”, I was surprised to learn that The Immigrant, James Gray’s tale of life in New York during the early part of the 20th century, a gorgeous film that I’m almost sure you missed at the theater, is available for streaming. That’s right, like a number of other hot titles have done lately, it skipped right over premium cable channels such as HBO or Starz and went right to Netflix, where we can watch it free (well, not quite free, assuming we’re not pirates and we’ve paid our monthly $7.99). The beautiful opening shot is of the Statue of Liberty shrouded in mist. (It’s a scene worthy of Chaplin – if he’d had access to the same technology while making his own The Immigrant in 1917.) It’s 1921. Ewa Cybulska (Cotillard) a Polish Catholic, has just arrived in New York after fleeing the deprivation caused by the First World War. She and her sister Magda (Angela Sarafian) are seeking a fresh start and their own piece of the American dream. What transpires next is what happens after the promise heralded by that first glimpse of America meets the grim realities of immigrant life. Magda is ill, and she and Ewa are immediately separated. For her part, Ewa, for reasons we don’t yet understand, is classified as a person of ‘questionable morals’ and in danger of being deported. Everything that follows results from Ewa’s efforts to both get her sister off of the island and keep them both from being sent back to Poland. Enter Bruno Weiss (Joaquin Phoenix). Is he a Good Samaritan in the right place at the right time, a well-dressed representative of the “Traveller’s Aid Society”? Or is he a pimp? He does in fact produce burlesque shows. And while it does not take long for Ewa, who is desperate rather than naïve, to figure out that her savior is indeed also a predator, Phoenix’s Bruno is no Snidely Whiplash and by no means a simple villain. He’s certainly charming, but is also by turns wicked as well as vulnerable. At what would seem to be her lowest point, Ewa crosses paths with the suave, and equally as charming magician, Orlando (Jeremy Renner), whom we come to learn, happens to be Bruno’s cousin. He’s instantly smitten. She tries to resist, but he sweeps Ewa off her feet and would appear to be a chance for her to escape the cruel world in which she finds herself. But is he everything he would seem to be? Or is he what the jealous Bruno says he is? There is history between them and that history will practically dictate their futures, but neither Bruno nor Orlando are all of one thing and none of the other. This makes sense, both because life exists in the gray areas, but also because the immigrant experience of the late-19th and early 20th centuries consisted of both struggle and triumph. Part of writer/director James Gray’s point would seem to be that although we now see the transition from the Old World to the New through the prism of time, tinged with nostalgia and family memories, to those making that long journey it was often terrible, and certainly strange. Ewa is forced into prostitution and rejected by relatives she thought would care for her, but she also must be devious and at times a thief. She is treated with suspicion by some of her new companions, particularly Belva (Dagmara Dominczyk – Mrs. Patrick Wilson – who is wonderful and should be seen more), another of Bruno’s girls. Through it all, Cotillard makes her shine like a diamond in a coal heap. The part of Ewa was written for her and I cannot imagine it without her. Ewa is intensely luminous, vulnerable, fragile and yet dignified. The camera lingers on her face in much the way it might have done with the silent stars of the era in which she’s placed. (She particularly brings Greta Garbo, in her early silent roles, to mind.) Cotillard projects precisely the qualities that would cause not just one, but two men to be prepared to risk everything after just a mere glimpse of her. Of course, in a film more interested in mood and feeling than in the mechanics of plot, some elements don’t work, and unfortunately Ewa’s relationship with Orlando seems little more than a structural convenience. While he serves to move the story forward, his character should have been more fully realized and his subplot given more time to develop. I have to wonder if there weren’t more to it that didn’t survive the cutting room. Ultimately, what we’re left with is a glimpse of early 20th century urban life, complete with a performance by Enrico Caruso (and set to the gorgeous score by Chris Spelman). The “doves” in Bruno’s employ, as well as their customers emulate the Astors and the Vanderbilts of Fifth Avenue in dress and mannerisms. It’s difficult to distinguish art from sleaze, since popular entertainment brought strippers, comedians and musicians together under one roof. Which is America in a nutshell. The tawdry exists side by side with the exquisite, brutality with tenderness. So it is with Bruno, and why we can’t quite separate the lost boy from the scoundrel. The Immigrant gives us the flip-side, or the mirror image of the American dream. It’s the warts-and-all version of the tale your great grandparents told about their adventures in “coming to America”, the antithesis of the Hollywood-glamorized version one would expect, but probably much closer to the truth. The Immigrant directed by James Gray, written by Gray with Ric Menello, with Marion Cotillard, Joaquin Phoenix, Jeremy Renner, Dagmara Dominczyk, Robert Clohessy, Adam Rothenberg, and Angela Sarafian. It debuted at Cannes in May 2013, has played film festivals all over the world, and now, thanks to Harvey and The Weinstein Company, can be found on Netflix. The moviegoing public has flocked to films about automatons, machines, automatons and robots since the movies began. One of the world’s first “blockbusters” or event movies, was Fritz Lang’s Metropolis from 1927, a film so beloved to this day that it has been updated, restored, and rereleased countless times. Banderas plays Jacq Vaucan, an insurance agent or accident investigator 50 years in the future. Earth’s ecology is on the point of collapse. Vaucan, working for the ROC Robotics Corporation, begins another routine investigation into the “illicit manipulation of a robot”, but this time he gets to know the ‘bots a little better than he bargained for, and even starts seeing their side of things, as the machines develop sentient intelligence and begin to rebel. What he discovers will have profound consequences for the future of humanity. I like it. It doesn’t appear nearly as cold and bloodless as the landscape or even the synopsis would suggest. Or maybe it’s just the pulse-pounding score they put under this trailer. But c’mon, how cool was that gunslinger robot throwing off his cape a la Clint Eastwood and his serape? In any case, we see lots of different robots in varying degrees of technological advancement, which may hint at some sort of class structure and sociological hierarchy among the machines. A ‘bot “Animal Farm” perhaps. 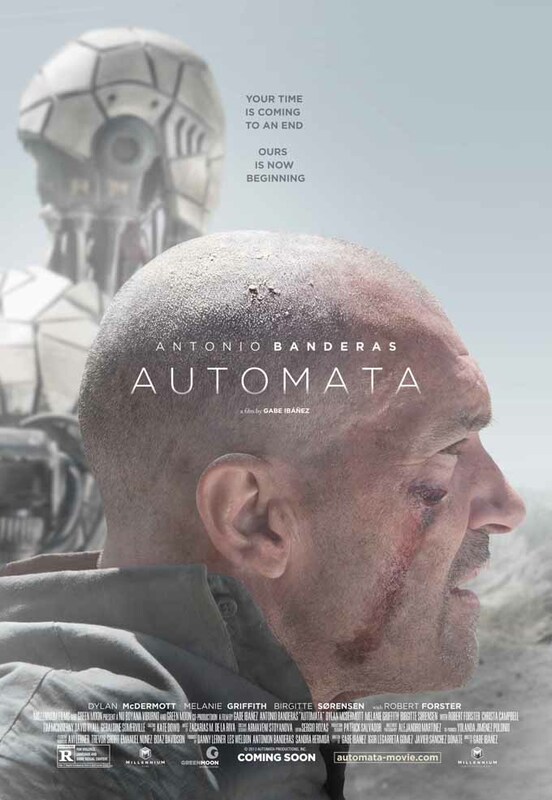 In addition to Banderas, Automata stars Dylan McDermott and Robert Forster (in an Olympus Has Fallen reunion – although they didn’t share any scenes in that film), Birgitte Hjort Sørensen, Tim McInnerney, Andrew Tiernan, and yes, that was Javier Bardem’s voice. Automata has been languishing on the shelf for a while, which explains the presence of the ex-Mrs. Banderas, Melanie Griffith. Automata bows at the San Sebastian Film Festival next month then opens in the US on October 10, released by, what seems appropriately enough, Millennium. I have no idea how to feel about this. The good news is that four months after the announcement that Olympus Has Fallen was getting a sequel, with the catchy title London Has Fallen, which one would think would be a HUGE clue as to the plot line, Millennium has finally signed a director for the project. The bad news is that his name is NOT Antoine Fuqua. I had been convinced that the reason the director of the original had not signed on for the sequel yet was that he was holding out for more money. After all not only was OHF a huge box office hit, but he’s got The Equalizer (with his Training Day star, Denzel Washington) in the can, a film with such high expectations a sequel to THAT film has already been green-lit. But it seems that Fuqua is moving ahead with his passion project Southpaw, with Jake Gyllenhaal. Or maybe the producers didn’t meet his price. Yeah, that’s a head scratcher. Maybe Melissa Leo recommended him, assuming she’s coming back for LHF (hey, she didn’t die in OHF), since she’s in TNDoCC as well. As it stands now, the only things London Has Fallen will have in common with Olympus Has Fallen will be its stars Gerard Butler (who will again produce) as Secret Service Agent Mike Banning, Aaron Eckhart as President Asher and Morgan Freeman as Speaker of the House Trumbull. The plot has them in London to attend the British Prime Minister’s funeral. Of course some brain-trust with an evil bent thinks that they can use this occasion to kill all of the world’s leaders and “unleash a terrifying vision of the future”. Of course. This premise is no more preposterous than that of Olympus Has Fallen, which I believe I’m on record as having enjoyed enormously. So, at least on that score, my disbelief is still safely suspended…for now. 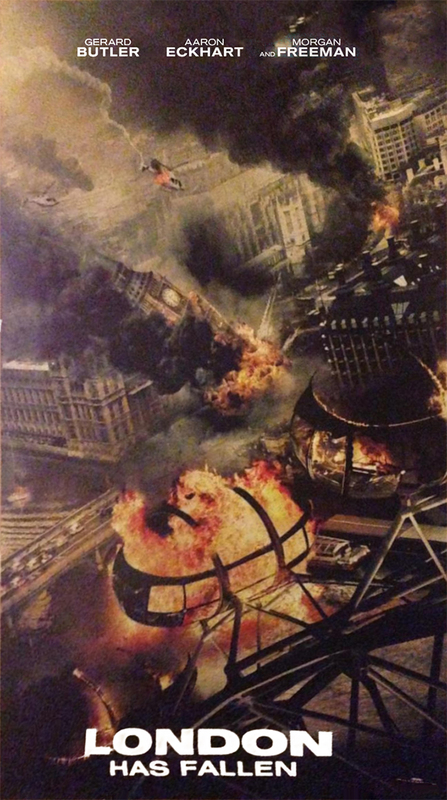 London Has Fallen has a release date of October 2nd, 2015 and production is scheduled to begin in October. Butler is supposed to be in Louisiana in October to film Geostorm for Dean Devlin. Millennium is based in Louisiana, so maybe it’s possible. (Hey, London is expensive.) More to come. **Edited to add: London IS expensive so London Has Fallen will, if the sets being constructed are any indication, be filmed in Bulgaria. Production may still begin in October, but filming is set to begin in December. (Hopefully indoors.) I knew that. So, what do you think of the latest development? Does the selection of this particular director have any influence on your interest in London Has Fallen? Another film you more than likely missed in the theaters is Labor Day, directed by Jason Reitman with Kate Winslet and Josh Brolin. (I’d been following it since filming began, since the story takes place and was filmed in the suburbs west of Boston. But I digress.) The movie is a sweet, old-fashioned love story. The type that could easily have been made by Howard Hawks in the 1940s or Nicholas Ray or Douglas Sirk in the 1950s, the type about which it could appropriately be said, “they don’t make ‘em like that anymore”. Until this one came along, that is. Critics, for the most part, savaged the film. Perhaps they’d have found it more plausible if it starred Humphrey Bogart and Lauren Bacall (or Gloria Grahame) or even Robert Mitchum and Jane Greer. It was the first of Reitman’s films to earn a “rotten” score on Rotten Tomatoes, let alone fail to earn a single Academy Award nomination (although Winslet did earn an obligatory Golden Globe nod. The HFPA loves her). Never one to let someone else tell me what I should like, I enjoyed it. I enjoyed the fact that Reitman took a chance on a genre completely out of his comfort zone. I enjoyed seeing Josh Brolin’s tender side. And of course, I enjoyed Kate Winslet as Adele, a woman on the verge of a nervous breakdown who not only finds love, but manages to find herself again, over the course of this one strange and sticky long weekend. It’s not really a spoiler if I mention the pie-making scene in which Brolin’s escaped convict, Frank, teaches Winslet’s blowzy single mother how to bake a peach pie. It rivals Patrick Swayze and Demi Moore and the clay in Ghost. But that’s getting ahead of myself. There is no “meet cute” for Frank and Adele, it’s more a “meet terrifying”. It’s 1987. The agoraphobic Adele and her 13 year old son Henry (an amazing Gattlin Griffith) have made the painful journey out of the house and into town because school is about to start and Henry has outgrown his old clothes. She’s terrified, he’s patient. While Adele trepidatiously pushes her cart through the store, Henry wanders off to look at comic books. Out from behind the rack pops a bleeding man. Having recently escaped from prison, Frank forces Adele and Henry to drive him to their house where he proceeds to hold them hostage. There is, of course, a lot more to Frank than his arrest record. The house is, of course, as unkempt and rundown as Adele herself and soon, as only happens in the movies, the hostage situation dissolves into something else entirely and we see Frank teaching Henry how to throw a baseball; he waxes floors and even irons. And again, as only happens in the movies, pretty soon it’s not only Adele’s car that gets a tune-up. For her part, Adele used to be a bright, vibrant woman until tragedy struck. As the adult Henry explains in voice-over (Tobey Maguire), “I don’t think losing my father broke my mother’s heart, but rather losing love itself”. It’s plain to see from the beginning that these two people need each other. Reitman admits that the hardest hurdle raised by the story was why this woman would take in this strange man in the first place, one who’s bleeding and probably dangerous to boot. And what about Henry, who is obviously a mature and savvy 13, why wouldn’t he stop her? But if you’re along for the ride, you understand. It’s because Adele sees the way he treated her son, and she responds to his courtesy toward her as well, and whenever she thinks he’ll behave one way, he surprises her. Adele also can’t bring herself to turn her back on Frank’s wound. Despite the fact that she can’t take care of herself, she has the skill to care for Frank. Again, we know that there is much more to the stories of these people, some of it we’re shown, some of it we intuit. If you’ve seen and enjoyed any of Reitman’s previous films, you know he is a master storyteller, and one of the biggest reasons is that he understands human nature. He helps us to understand that these two wounded people just fit. Okay, okay, before the eyerolling begins, let me add that I can understand how you might have some difficulty buying into all of that, at least on the face of it. But it is Winslet and Brolin, (such an unexpected pairing in real life and on film), and their earthy, sexually-charged chemistry that sells the entire package. Sure it’s a preposterous premise. But it was no less preposterous when Joyce Maynard published the novel in 2009. It became a bestseller and achieved widespread critical acclaim. Why any of this would be any less easy to accept in film form, from a cast and crew as talented as this movie had, doesn’t make much sense to me. For my money, Labor Day is a warm and lovely little film about longing, hope, and the redemptive power of love, beautifully photographed by Reitman regular Eric Steelberg, with an evocative score by another regular, Rolfe Kent (who also composed the score for Dom Hemingway). It was a novel, not a memoir. It’s a movie, not a documentary. If it’s a good story, emotionally gripping, well told and well acted, isn’t that enough? Labor Day also stars Clark Gregg, James Van Der Beek, J.K. Simmons, and Brooke Smith. It’s out on dvd and blu-ray today, August 5. 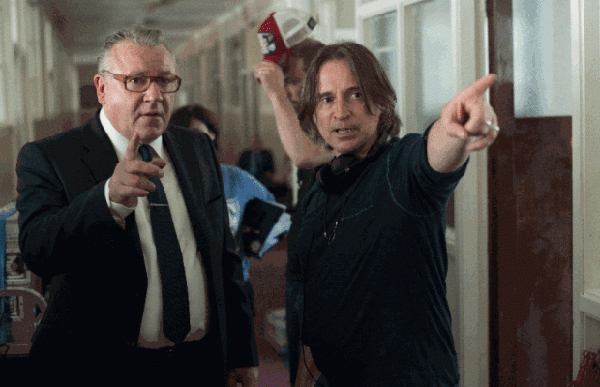 Another one of my favorites, actor Robert Carlyle, has spent the summer up in Glasgow where he has just finished principal shooting on his directorial debut, a black comedy called The Legend of Barney Thomson. The photo above of the director with one of his stars, Ray Winstone, is the first image from the set . There is so much for me to like about this, I can hardly contain myself. In addition to directing, Carlyle plays Barney and stars along with Winstone and the always wonderful Emma Thompson, who will bring her formidable acting skills to bear as she plays the mother of a man who is a mere two years her junior. The script is based on a popular series of novels by Douglas Lindsay, with a screenplay by BAFTA winning writer Colin McLaren and Richard Cowan. Barney Thomson, awkward, diffident, Glasgow barber, lives a life of desperate mediocrity and his uninteresting life is about to go from 0 to 60 in five seconds, as he enters the grotesque and comically absurd world of the serial killer.Complicating matters further, Barney’s mother, Cemolina (Thompson) cheerfully emasculates him at every turn, causing a bloody and comedic chain of events. While Barney clumsily tries to cover his tracks, Glasgow police inspector Holdall (Winstone) fights his own battles within his inept homicide department as he tries to solve the crime of the century. The rest of the cast includes Sir Tom Courtenay, James Cosmo , Ashley Jensen, Martin Compston, and Brian Pettifer. Icon (Mel Gibson’s company) has the UK distribution rights, so although The Legend of Barney Thomson doesn’t yet have a release date, I think it’s safe to assume one will be forthcoming. When I know, you’ll know. In the meantime, peep these pics of Ms Thompson and Mr. Carlyle on set. 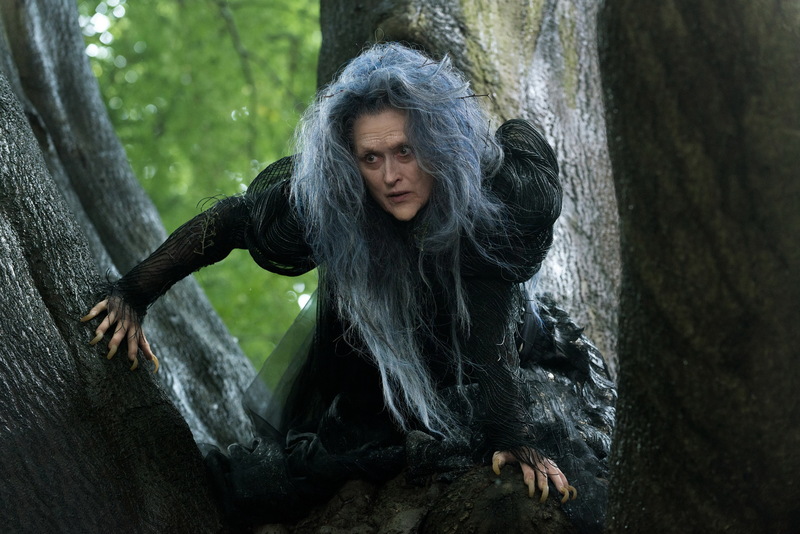 We have the first trailer for Into the Woods, the latest film version of a Broadway musical from Chicago’s Rob Marshall. It’s based on the award-winning show by Stephen Sondheim, who is a legendary wordsmith, and James Lapine. I spent quite a few years working part time at the box-office for a production of “Forbidden Broadway”. When “Into the Woods” was new, the parody version was called “Into the Words”. That I use that title now, is apropos because this trailer barely has a soundtrack, let alone a song. Are Disney and the producers hedging their bets? Do they not want anyone to know that Into the Woods is a musical? Only fans of the show will recognize the film’s logo as the one used on the show’s Playbill. It is the fans of the show, which opened on Broadway in 1987, that have been clamoring for a film version ever since. I don’t think anyone else will care. Then again, this is but the first teaser. “Into the Woods” was the first show I saw on Broadway, so I have a special place for it in my heart, but I can’t say that I’m eagerly awaiting this movie. In fact, I distinctly remember groaning “WHY? !” when I heard that this was in the works and when Ms. Streep was announced to star. Catherine Zeta-Jones, Michelle Pfeiffer, Idina Menzel, Penelope Cruz, Donna Murphy, Miranda Richardson, Kate Winslet, and Nicole Kidman were also considered. Wonderful actresses all. (Murphy played the role in a summer revival in Central Park. Menzel probably turned it down. Who wants to be typecast as a witch? ), but to me, the role belonged to Bernadette Peters; which is yet another reason I have to wonder who this movie is for. Fans of Broadway musicals would pay to see her in a role she created and aren’t going to pay to see this movie version just because Streep is a bigger name. For those unfamiliar, Into the Woods is a sort of compilation of the characters from the stories of the Brothers Grimm. There is a childless baker (Corden. Blunt plays his wife) who attempts to lift a family curse by journeying “into the woods” to confront the witch (Streep). Is she evil or just misunderstood? In the show she definitely gets the best song. Along the way he encounters Rapunzel (Mackenzie Mauzy), Cinderella (Kendrick), Jack (Daniel Huttlestone) and his Beanstalk and Red Riding Hood (Lilla Crawford) among others. And the witch is there to teach them all important lessons. Marshall’s film, with a screen adaptation by Lapine is fairly close to the original stage musical, with the exception of the Narrator, who was dropped in favor of using the Baker for voiceover narration. Another noticeable change is the cut of the Mysterious Man. The role played by Streep is a combination the Witch with some of the Mysterious Man thrown in. Into the Woods opens in the US on Christmas Day, (just in time to lock up that Musical/Comedy Golden Globe nomination and probable win. And if you think that’s not a consideration, why else were so many of the show’s songs cut so that Sondheim could fit in two just for the movie, if not to win Best Original Song?) and 9th January in the UK. (Doesn’t that make it BAFTA ineligible?). The rest of the cast includes, Tracy Ullman, Annette Crosbie, Tammy Blanchard, Lucy Punch, Simon Russell Beale, Billy Magnussen and Christine Baranski. More will follow. What are your first impressions?